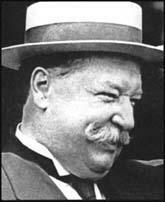 William Howard Taft was born in Cincinnati, Ohio on 15th March, 1857. William, the son of Alphonso Taft, secretary of war and attorney general under President Ulysses Grant, studied at Yale University and was admitted to the bar in 1880. A Republican, Taft held several political offices before becoming a judge in Ohio in 1887. This was followed by periods as solicitor general of the United States (1890-92) and in the United States Sixth Circuit Court of Appeals (1892-1900). As a judge he upset the trade unions when he ruled that secondary boycotts were illegal. In 1900 President William McKinley asked Taft to organize civil government in the Philippines. When this was completed the following year, Taft became the Philippines first civilian governor. His success at developing the economy of the islands made him extremely popular with the people. In 1904 President Theodore Roosevelt appointed Taft as his secretary of war. When Roosevelt decided not to stand for re-election in 1908, Roosevelt supported Taft in his successful campaign against the Democratic candidate, William James Bryan. During his period in power Taft established the federal postal-savings system and enforced anti-trust legislation. Theodore Roosevelt, who had grown more radical out of power, was disappointed with Taft's record. In 1912 Roosevelt stood as the Progressive Party candidate against Taft. This split the traditional Republican vote and enabled Woodrow Wilson, the Democratic candidate, to be elected. After losing power, Taft became professor of law at Yale University and served on the National War Labour Board in 1918. After the First World War Taft supported Woodrow Wilson and his attempts to persuade Congress to agree that United States should join the League of Nations. In 1921 Taft was appointed chief justice of the United States. William Howard Taft remained in office until shortly before his death on 8th March, 1930.